Fly into Mandalay, take a taxi into town and check into a hotel. En-route ask the locals; what are the biggest issues confronting Myanmar today? Poverty remains an overwhelming blight but a close second, more than likely, will be China's contentious presence in this struggling Southeast Asian nation. It's a constant source of irritation, and awkward innuendo, says Phone Hlaing, a 48-year-old taxi driver who points towards a billowing chimney and says China bashing is a minor national sport. "That's an alcohol factory. It's owned by Chinese," he said. "The Chinese own the factories. We do the work and they make the money." His dislikes include Tin Maung, whose Great World Company faced heated protests and demands for the closure of four units — a sugar mill, a methanol plant, a distillery and a plywood factory — for causing massive pollution. He and his wife Nan Hla Sein — both Chinese — face allegations of using illegal Chinese labor to build a seven-story hospital, and employing unregistered Chinese doctors, on a block of land licensed for a five-story plaza. Across town graffitists are attacking signs with Chinese characters. Phone Hlaing's sentiments were echoed by artist Naing Myo Wai from his studio at the base of Mandalay Hill where his paintings fetch about US$1,000 each and have been exhibited widely. "Most foreigners are interested and they value my art," the 47-year-old said. "But the Chinese, I have no expectations of them. I don't want to blame them but they could be more interested in our art and our culture." 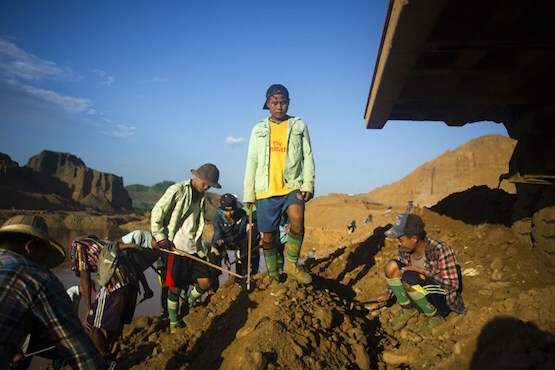 Their complaints sound a familiar ring to anti-globalist activists but it's an issue that is further complicated by Myanmar's poverty and China's close reach. Despite their reservations Naing Myo Wai and Phone Hlaing said without Chinese investment Myanmar would be even poorer than it is today. After half-a-century of military rule Myanmar languishes at 150 out of 187 countries on the Human Development Index with a per capita income of just US$700. Only 26 percent of the population has access to electricity. The rest burn timber for energy. Military rule was an era of oppression and U.S.-led sanctions imposed by countries that objected to the junta's rule. China was the exception, until November's historic elections put Aung San Suu Kyi in power. According to the Global Environmental Institute, Chinese spending here emerged in 2001 when Beijing launched its "go global" policy with foreign direct investment (FDI) providing the means. FDI surged from a mere US$11.5 million in 2005 to US$876 million in 2010 and anti-Chinese sentiment rose in equal measure. "The Chinese are perceived as being everywhere because they have close ties with authorities which comes with their business dealings," said veteran commentator and senior advisor at the Mandalay Journalist School (MJS), Kyaw Yin Mint. "They also like to boast about their wealth. At weddings and grand ceremonies all the roads are blocked and filled with expensive cars," Kyaw Yin Mint said, adding this had soured impressions among locals. He said Chinese interests ranged from private hospitals to railways while illegal Chinese laborers had also brought sexual diseases with them. "Chinese business runs freely. If a daughter marries, a chief minister will go to the wedding. The police see this and realize such businessmen should not be interfered with," Kyaw Yin Mint said. At the crack of dawn, along the moat surrounding Mandalay's long-vacated royal palace, hundreds of Chinese line the weathered bridges and footpaths for morning calisthenics. Interviews are shunned. It was the same at the plush Jin Taw Yan Buddhist Temple — the pride of the Chinese community and home to the Chinese Women’s Association and the Mandalay branch of the Myanmar-China Friendship Association. "The main reason why people have misunderstandings about China is the lack of transparency, particularly under the previous government," Moe Kwa Kwa an ethnic Chinese and deputy head of the Mandalay Region Chamber of Commerce & Industry, said. Three major Chinese investment projects — the oil and gas pipeline from the west coast of Myanmar into China, the Myitsone Dam and the Letpadaung Copper Mine — ran foul of locals. Protests led to lengthy delays for the dam and copper mine, resulting in Chinese FDI plunging 75 percent in 2011. It has fluctuated heavily ever since. Moe Kwa Kwa says distinctions must be drawn between mainland Chinese businessmen and locals with a Chinese heritage. "Among ourselves, we never have a problem. Our culture, our religion and our business practices are the same," he said. "But the mindset of the mainland Chinese is different. They bring no culture, no religion — just business and that is their only culture in this country." Moe Kwa Kwa said Chinese investors focused on jade, big infrastructure projects and controlling land where foreigners are not allowed to own. But the most sensitive issues were deals hatched by the Chinese with the widely-loathed generals. "In the last decade — when people were fighting for democracy — Beijing was backing the military and making money. What's important is they backed the military," he said. "People remember that." Sanctions have eased with Aung San Suu Kyi's election but the United States — anxious about the massive wealth accumulated by the generals — is yet do decide how quickly it will respond to the Nobel Laureate's election to office. But approved FDI, according to Myanmar's Directorate of Investment and Company Administration, soared to $8.01 billion in 2014/2015 and almost doubled over the last financial year. "It changed with the elections and business groups from India, Thailand and Japan have come — in future the balance will be better, not just Chinese but also the U.S. and Europe. Myanmar is trying to maintain a balance between global powers," Moe Kwa Kwa said. At MJS, Kyaw Yin Mint says freedom of speech, which accompanied Suu Kyi's historic win, has enabled people to voice decades of pent-up complaints, adding there was a tendency to exaggerate problems blamed on the Chinese and a failure to acknowledge that relations with Beijing have improved. "People are free to speak their minds and their prejudices are many." He said the number of Chinese people living in Myanmar is about the same as it was three decades ago, about three percent of the population, and there have been efforts to mend fences. Tin Maung has given back land while legal action is pending against his wife. Kyaw Yin Mint said Chinese generosity had been substantial during recent floods that disrupted the lives of 400,000 people and he noted that Beijing no longer backed the military. "It has calm downed. People have a belief in Suu Kyi — that she can carry out reforms," he said. It's a message yet to leave its mark on Myanmar's artists and taxi drivers but Kyaw Yin Mint added: "There have been no riots and relations between villagers and the police today are okay. They are trying to solve many problems — peacefully."